On the Saturday before the national holiday recognizing the dream and legacy of the nation’s greatest moral leader, the constituents of Western North Carolina gathered for The Annual Dr. Martin Luther King, Jr. Celebration. The day was filled with the hope that Dr. King’s dream of a ‘beloved community’ would be realized (made real, understood), visualized (seen), and actualized (acted upon). And so, with the theme “Opening the Door to Reality: All Lives Matter,” the people of God engaged the work of shaping the conscience of the community of faith. The celebration was held at First United Methodist Church, Salisbury, NC where the Pastor is The Rev. Mark Conforti. After Rev. Conforti welcomed the more than 150 participants, the tone for the day was set with an opening dramatic monologue by Mrs. Doris Vincent, of Laughlin Memorial, Greensboro. The dramatic rendering quickly grabbed our attention by offering an historic perspective of America’s callous treatment of African-Americans. As Mrs. Vincent spoke, images were flashed on the screen and music was rendered, which helped participants realize and visualize the importance of the gathering. Dr. King certainly had a vision that all lives matter, which was the theme for the day, but his conscience caused him to speak out on behalf of those lives that did not seem to matter. In the 1960s that meant speaking out on behalf of African-Americans, the poor, and the disenfranchised. However, the current reality still suggests that there are those whose lives seem to count less than others. While the celebrants meditated on the morning monologue, our musical guests, The Middlebrooks Family was introduced. Throughout the event the Middlebrooks sang several traditional and contemporary gospel melodies. The Middlebrooks are family members of deceased WNCC Elder, Rev. Willie L. Middlebrooks, Jr. The Middlebrooks Family has a rich legacy of proclaiming the Word of God through preaching and singing. They were led by their brother, The Rev. Ronnie Middlebrooks. Additionally, the recipients of President Obama’s Drum Major for Justice Award, and the top three Essay Contest winners were recognized and honored. The recipients for the Drum Major for Justice Award included: Mrs. JoAnn Carter (Celia Phelps UMC, Greensboro), Mrs. Susan Helena Scales (St. John UMC, Eden) and Mr. Rayfield Cabiness, Sr. (posthumously). The Essay Contest winners were: Mr. Matthew Abraham (High School Jr.) of Simpson-Gillespie UMC, Miss Makayla Pryor (High School Sr.) of Hunters Chapel UMC, and Miss Jalen Rivens (Middle School 7th grader) of Hunter’s Chapel UMC. Each essay winner received a certificate of appreciation and a cash prize. Of course, they were all encouraged to remember their church by giving a tithe of their cash prize. The design team for this event chose to go with the ‘All Lives Matter’ in its theme, not to dismiss “Black Lives Matter,’ but as an affirmation of the spirit of Dr. King, who said, “We must learn to live together as brothers [and sisters] or perish together as fools.” Several individuals shared their thoughts after engaging in this meaningful and relevant dialogue. 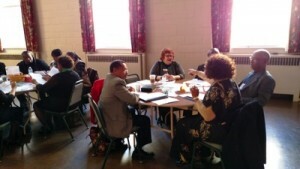 In light of what was said and heard, each person was asked to reflect on what God might be calling them to do. Additionally, each person was challenged to go forth to promote the cause of justice for those who are oppressed and promote deeper unity. Finally, the day culminated with a closing worship service and communion. The Scriptural underpinning for the worship came from Galatians 3:26-28. The text was read in four diverse languages, including Korean, Rev. In-Yong Lee (Cokesbury UMC), Spanish, Mrs. Rocio Ramirez (Mouzon UMC), Ashanti Twi, Mrs. Belinda Ellis (Ghana Community Mission), and English, (Rev. Rodvegas Ingram (Salem/St. John UMCs). 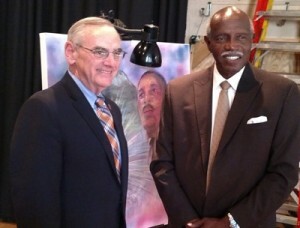 Artist, Mr. Fredrick Jones, Sr. (Memorial UMC) added a visual component to the readings, an interpretive charcoal drawing. Bishop Larry Goodpaster delivered the message and served as the Celebrant for communion. Bishop G’s message tied everything together in his unique way. Bishop G has been a passionate supporter of The MLK, Jr. Celebration during his tenure in Western North Carolina. This event was his last MLK, Jr. Celebration as the Resident Bishop of the Western North Carolina Conference, pending his retirement at the end of this conference year. He was presented with a commemorative plaque on behalf of Black Methodists for Church Renewal and the Justice and Reconciliation Team of WNCC. He was also presented the interpretive drawing by Mr. Fredrick Jones. The Rev. Miller Carter, Jr. is pastor of Simpson-Gillespie UMC, chairperson of WNC’s Black Methodists for Church Renewal and a member of the MLK, Jr. Celebration Planning Team.